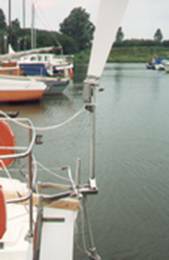 The design of the Holland Windvane guarantees one of the best performing windvane self steering systems on the market today, in strong and light wind conditions, even when sailing down wind. 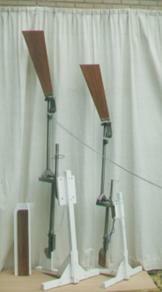 · In case of a collision underwater, the pendulum rudder tips up. When the system is not in use the rudder can be stowed safely protected by the frame. · The entire frame can rotate a bit in order to absorb impacts and so minimize or prevent damage. 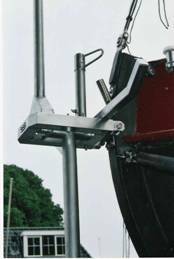 · On boats with a negative stern or transom hung rudder a 10 degree angled version is used to move the weight more forward and to improve accessibility. · The weight of the small/large model Bouvaan is 14/20 kg. · Height and length of the construction are calculated and specified to the client for each stern-configuration. Custom modifications to the construction or the design are easily made due to the use of commercially available materials. · The Holland Windvane is available in 2 models, the small BOUVAAN and the large BOUVAAN. 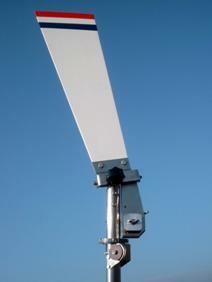 · The Holland Windvane is a powerful windvane steering system. The force (couple) generated by the small and large BOUVAAN is 40 and 110kgm respectively. 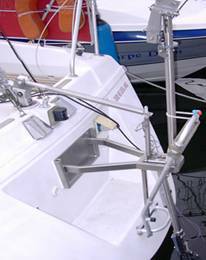 · Which BOUVAAN is best suited to your boat depends on the rudder forces. This is a combination of speed potential, rudder-configuration, surface, dimensions & shape and balancing part of the rudder. · Based on these data or from the database of equipped boats, the rudder forces are calculated to select the appropriate BOUVAAN for each boat. Building the Holland Windvane normally takes around 80-120 hours. No specific metal working experience is required, only good all-round do-it-yourself skills. Tasks to build the Holland Windvane are mainly sawing, filing and drilling stainless steel, to be completed with some welding. For drilling and sawing, steel jigs and paper templates are provided. It is recommended to hire a professional for the welding. This relatively small investment will improve the quality of the construction and increase the second hand value.